Gazelle The Horn > Apple News > Apple Watch Enthusiasts, Rejoice! 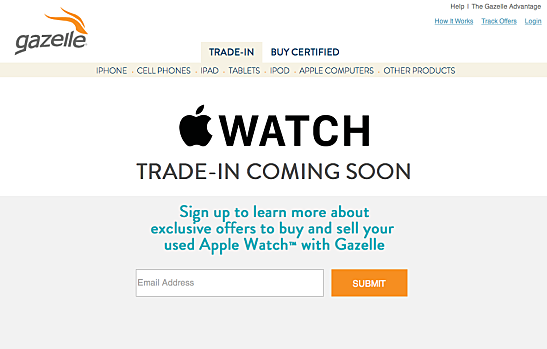 Today, we’re announcing that Apple Watch gawkers will soon be able to trade-in and purchase certified pre-owned Apple Watches through Gazelle. Enthusiasts can sign up here to learn about these updates. As Tim Cook wrapped up his September 2014 Apple event, he uttered the famous words, “One more thing.” That’s when we first officially learned about the Apple Watch. This is Cook’s first product launch since taking over as Apple’s CEO in August 2011, and it has received the same high level of buzz and interest that we’ve come to expect from Apple. Gazelle has kept our eyes on this gadget and we knew back in September that it would be a must-have device. It’s no surprise, the Apple Watch is a beautifully designed product, falling right in line with iPhones and iPads. Apple’s history has shown there is an insatiable demand for its products, due to their unparalleled design and overall ease-of-use. The wild popularity of Apple products has helped Gazelle become the leading gadget trade-in site. So we looked back into our own data archives to explore how the first generation iPad maintained its value over time. As the numbers suggest, the first generation iPad held its value remarkably well over the years, even after Apple announced subsequent versions. We expect a similarly strong market demand for second-hand Apple Watches. Bring on the trades and the sales.